Chorley Garage Doors install remote control electric garage doors. We can fit, repair or replace remote control garage door systems to a new or existing garage door. Using high quality and reliable equipment our automated garage doors are smooth and powerful. To arrange a free site survey and quotation call Adam on 01257 733 133 or contact us online . Imagine arriving home and at the simple touch of a button, driving straight into your garage without having to leave the comfort of your car. Don't battle the elements in the dark looking for your key - install an affordable remote control automated garage door system from Chorley Garage Doors. 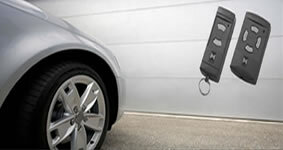 Our electric garage door systems bring you a touch of luxury at a surprisingly low cost. Our electric garage door systems comply with the latest European standards (BS 13241) and have safety features such as automatic reversal and self-monitoring closing forces. Security is provided an integral anti-burglar device preventing the door from unauthorized forced entry. Remote control garage door nstallation, repair and upgrades to existing garage doors in the Chorley area including Adlington, Buckshaw Village, Brinscall, Coppull, Charnock Richard, Euxton, Eccleston, Heapey, Heath Charnock, Standish, Wheelton and Whittle Le Woods. For more information on electric remote control garage doors call Adam on 01257 733 133 or contact us online. For professional and friendly help with all of your electric garage door needs contact Chorley Garage Doors today.